Madison County is a rural county in Central Ohio - an area of large farms and the second largest school district, mile wise, in the state of Ohio. Being sparsely populated, it has a small student enrollment in the four school districts: Jonathan Alder, London Madison Plains, West Jefferson and Tolles Technical Center that serves the vocational students of the area. Twelve local retired teachers met at London High School on February 21, 1967 to set up a chapter of ORTA. Mr. H.W. Carr, Central District Director and later president of ORTA (1970), presided at the session. Mr. Carr was assisted by Mrs. Ethel Helser, president of the Union County RTA Chapter. Temporary officers were named to serve until the next meeting. Today, Madison County RTA has six meetings a year. Individual members participate in volunteer programs throughout the year. A newsletter helps keep members informed about current topics. 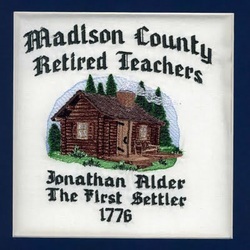 The quilt block is a tribute to Jonathan Alder, the first settler.